U.S. Secretary of State Mike Pompeo condemned freshman Rep. Ilhan Omar’s (D-MN) use of anti-Semitic tropes during his visit to Israel Thursday. 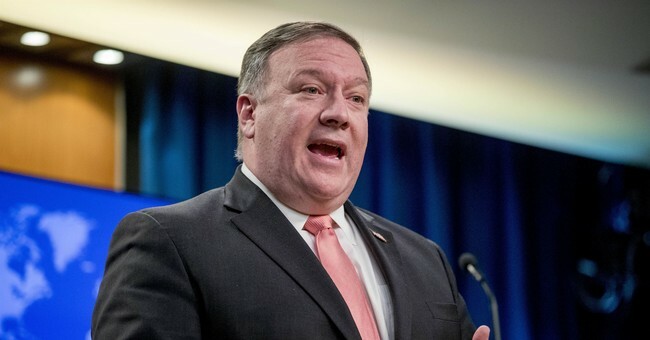 "To see this from a member of Congress like Congresswoman Omar is—I talked about this being dark," Pompeo told the Christian Broadcasting Network during an interview in Jerusalem. "The rise of anti-Semitism in the United States and in Europe and in, frankly, all across the world is something that is deeply troubling, and to see someone—a duly elected congressman—behave in that way, to speak about anti-Semitism in that way, is of great concern." "It’s a great concern to me," he emphasized. "This administration speaks the truth, and anti-Semitism is unacceptable in any form from anyone, but to see it come from one of America’s leaders is just abhorrent." Democrats struggled last month to pass a resolution condemning Rep. Omar’s remarks which she made “about the political influence in this country that says it is okay for people to push for allegiance to a foreign country,” in reference to Israel. Many of her fellow Democrats condemned these comments as a reference to an anti-Semitic “dual loyalty” trope. Omar has also had to apologize for similar past comments that were widely interpreted as anti-Semitic. Ultimately, however, a resolution condemning anti-Semitism in response to the remarks never named Omar and passed by a vote of 407-23. It was broadened to include the condemnation of other forms of bigotry. It "rejects the perpetuation of anti-Semitic stereotypes in the United States and around the world, including the pernicious myth of dual loyalty and foreign allegiance," and "condemns anti-Muslim discrimination and bigotry against all minorities as contrary to the values of the United States." Rep. Liz Cheney (R-WY), the third-ranking House Republican, argued that the resolution "was really clearly an effort to actually protect Ilhan Omar, to cover up her bigotry and anti-Semitism by refusing to name her." Democrats have had to respond to concerns about anti-Semitism in their party as some of the top 2020 presidential hopefuls are snubbing the American Israel Public Affairs Committee's annual Policy (AIPAC) conference after calls from progressive groups to boycott it. President Trump accused Democrats of being “anti-Israel” and “anti-Jewish” Friday ahead of meetings with Israeli Prime Minister Benjamin Netanyahu.